I play an MMORPG called Elsword, and it is having an official tournament (Though it may be over by the time this post goes up—which is likely, and I’ll explain why that is momentarily). I’m writing this the day before practice for the tournament starts, but there are already many flaws in the way this tournament is being ran. I’ll be explaining them here—maybe one day, one of you readers will be planning an official tournament of your own. You can look back on this article to think about the wrong way to do it. One thing that may throw people off is that the prizes wouldn’t be revealed until the day after the registration. The line of thinking from the GM team was that by not revealing the prizes until registration closes, you wouldn’t see weak or unskilled players joining just to try to get an incredible prize that they have no chance of winning (since the brackets were on a “first-come first-serve” basis, every slot matters). I can actually respect the idea of not wanting people to join just for the prizes, especially since this company has given out some pretty incredible prizes for previous tournaments. They dropped the ball on this tournament, though. They used to give out thousand-dollar monster gaming laptops to the top winners of these tournaments, but this time, the top six finalists get $50 of premium currency and the overall winner gets $200 of premium currency—Remember, this is an MMORPG, so it runs on the freemium / item mall / gacha format. Had I known that this was the prize set, I wouldn’t have entered the tournament…not because I think it’s a weak prize (though it is a weaker prize, that’s for sure), but because I have to make it to the final six to win anything at all. Let’s talk about timing. The minisite for the tournament stated that the brackets for the tournament (the list of who fights who) will go live on Monday. And they were half right—on Monday, I was able to see who would be fighting who. At 10 PM. However, they weren’t exactly “made live”: A user in the game’s official Discord server somehow had the brackets (who knows how he got that?). They were not posted in any official section (the Discord’s announcements page, the tournament’s minisite, anywhere else on the website) until the next day. Also, for some reason, whether or not the tournament’s brackets show on the minisite is tied to your cookies. I don’t see the brackets normally, but I can see them if I open the minisite on private browsing. I don’t know anything about website design, but how do you mess it up in that regard? Elsword has a ranking system in place in its official PvP to prevent newer players from being matched up to fight against the game’s elite veterans. You’re not allowed to join without a rank—and while you would think that’s because the people designing the brackets wanted to ensure people with similar ranks fight each other, that ended up not being the case. The ranks attached to each member of the bracket weren’t made live. Someone dug up everyone’s ranking information using the leaderboards on the website. After A, ranks are counted on S-counts (Ses? Esses?). This includes S, SS, and SSS. At the very top is the highly-coveted star rank. And there are star-rank players here having to fight B-rank and A-rank players instead of other star-rank players. The day I am writing this is Tuesday, May 8th. My matches start on Wednesday, May 9th. Brackets were released Monday night. Tuesday is my single full day to practice. They gave me a whole ONE day to practice. Though, you can claim that I should’ve been practicing ever since they announced there would be a tournament at all, but it would be a waste of time to practice only to find out that I didn’t make it in the tournament. However, there are six separate brackets for this tournament. 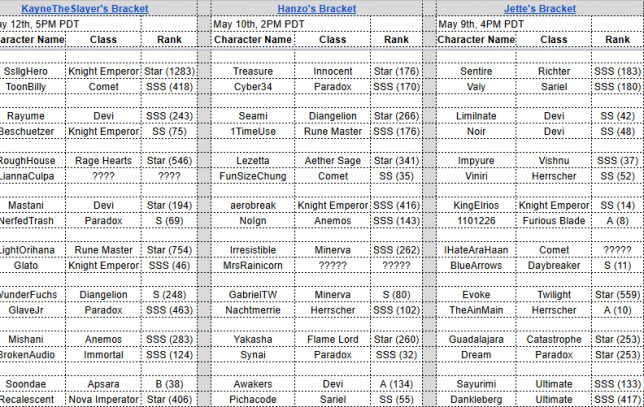 Each bracket is run by a separate member of the official stream team, and each bracket is on a separate day. This means that some people may have six days to prepare, while some people (like myself) only have one. Also, because each bracket is on a different consecutive day, most of these tournaments are on weekdays and not on weekends. Why is that? Why have the official tournaments be during the time that less people are playing? The general playerbase of Elsword is teens and young adults, generally in the 13 to 21 range. Aren’t most of them at work or school on weekdays? Isn’t it just more hype to watch a tournament during the weekend anyway? Whatever the case, I’m writing about this before a single tournament fight has started. Once I finish this post, I’m going straight to practice. Maybe I’ll write a follow-up article describing my experience when its all over. Hello world, I am Brancliff. I like long walks on the overworld and actually-thought-out YouTube comments. My goal is to become internet famous. Let's see if this free game is any good, shall we?